Think of the sea coming into shore and the way the ocean moves as one. Suddenly, a wave emerges that gets bigger and bigger as the ocean comes together in perfect harmony to create something strong, powerful and unstoppable. That is the image on the front of these Team Ocean business ecards and symbolises that a team, like the sea forming that wave, can come together to create something spectacular. 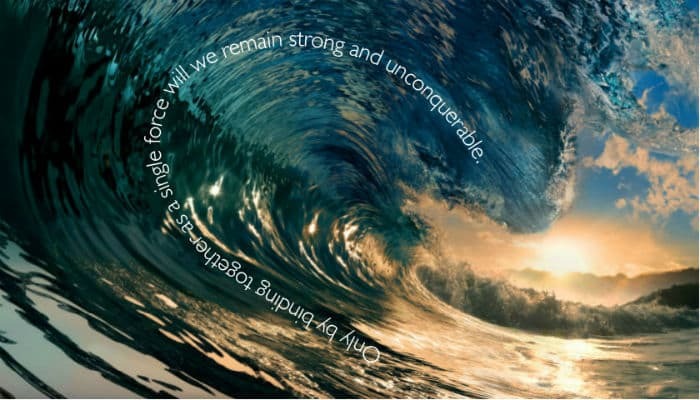 The wise words that coil around the wave read “Only by binding together as a single force will we remain strong and unconquerable”. This saying perfectly sums up the mind-set of teamwork and how important that you are all dancing to the same tune, all on the same page, etc etc. You could be the leader of that team, or you could be a member, it really doesn't matter where you rank what is important that a team needs to know they are getting right and positivity breeds productivity. Send this ecard out to the members of your team, add a personal message if you want to leave it how it is. Either way, letting your colleagues know how proud you are to be working with them and being part of such a great team will have a positive impact on every member. Sending holiday ecards for business could be similarly powerful for your company come Christmas time and your holiday marketing plans. Check out ours while you are with us.